Friday night Rob Kapilow brought another What Makes It Great® concert to Jordan Hall as part of the Celebrity Series. The musical work on the program was the Four Seasons of Buenos Aires by Argentinian “new tango” composer Astor Piazzolla. I had never heard Kapilow do What Makes It Great®, although he has he has been producing short features by that name for NPR for over a decade, and has appeared more than thirty times in the Celebrity Series. What Makes It Great® is Kapilow’s unique explication of the piece at hand–in the awkward words of the press release, he “dissects a selection of music in a listener-friendly way—pulling themes apart, demonstrating how melodies might sound in lesser hands, guiding listeners through the maze of themes…” This occupies the first hour of the evening; after intermission, the piece under discussion is performed in its entirety, followed by a brief question and answer period. The experience does not presume any musical knowledge – terms such as “arpeggio”, “pizzicato” and “third” are all patiently and quickly explained. Edward Said opined in 2003 that “today’s literary or general intellectual has little practical knowledge of music as an art… and except perhaps for buying records or collecting a few names such as Karajan or Callas, [little] sustained familiarly with… the actual practice of music.” Kapilow is retailing the “secrets” of concert music that remain a tantalizing mystery to those that lack such “practical knowledge”. I imagine many readers of this site would have been as impatient as I with the first hour of the evening. As much as I love Piazzolla, these four movements are neither complex enough nor underserved enough to require this kind of interpretive advocacy. I had an uncomfortable sense that he was overselling Piazzolla so as to help reassure the audience that this immediately accessible music was in fact “great.” A passage of melodic simplification became “Beethovenian”; the repetition of a four-chord harmony became a “chaconne”, and hence a connection not just to Bach, but to Nadia Boulanger. In fact, anything resembling counterpoint was attributed to Mr. Piazzolla’s instruction with Boulanger, who we were reminded multiple times also taught Mr. Kapilow. His favorite device was to make a “Kapilow version” of a passage, a version stripped of those qualities that made it distinctive, ironing out syncopations, removing the dissonances from melodies or chords. This would then be contrasted with the real thing. This did show Piazzolla’s devices in sharp relief, though as an analytical tool it quickly exhausts itself. But to be sure, Mr. Kapilow had the audience in the palm of his hand, his boyish, even goofy, personality winning the room from the beginning. But now, to the music. Piazzolla suffers (as will almost everyone) in comparison with Bach and Beethoven, but he has his own distinctive gifts. He has more in common with Scott Joplin. Both took music that developed in disreputable environments and fixed upon it an aesthetic sensibility and musical intelligence that lifted it to a different realm without losing its vitality. Both drew French inspiration, Joplin at second hand from hearing the music of the late 19th-century France, Piazzolla at the feet of Boulanger, though Piazzolla had the advantage of thorough musical education and international recognition during his lifetime. Piazzolla at his best takes the conventions of tango—its characteristic rhythms and bass lines, its inherent passion—and turns it into an aesthetic object that divorces it from its original roots in dance. It tends towards melodrama, fast sections frequently threatening violence, slower sections singing out long lines that crash sweatily into their cadences. The music itself was performed by the JP Jofre New Tango Quintet: JP Jofre on bandoneon, Christiana Liberis on violin, Carlos Pavan on electric guitar, David Segal on double bass, and Natalie Tenenbaum on piano. The bandoneon is an accordion-like instrument, with buttons for both hands and a hugely expandable bellows. Jofre was able to extend it to what appeared to be almost five feet, making a dramatic picture frequently he employed at the crashing end of sections. The bandoneon was Piazzolla’s own instrument, and the traditional instrument of tango. It has a deep, darkly resonant sound, with a reedy edge. Unlike Vivaldi’s Four Seasons, the Four Seasons of Buenos Aires has no explicit program; neither do they strive for particularly vivid depictions of each of the seasons. The pieces do not give a sense of having been thought of as a unit, either. I assume they were chosen for this concert on the basis of the familiarity of the “Four Seasons” name, and because they have enjoyed some popularity in a somewhat odd string orchestra arrangement Gidon Kremer recorded last decade. For those who know the album, this performance provides quite a contrast, the muscularity of the quintet proving quite different from the watery violin concertos that appear on the recording. Each movement uses a common vocabulary—alternating vigorously intense allegros featuring a virtuosic bandoneon and percussive piano with languorous and passionate slow sections frequently featuring long, singing violin lines. 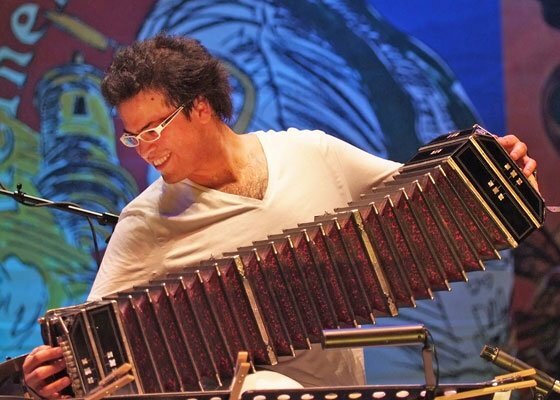 This music lives or dies with the bandoneon, and Jofre has the technique and personality in abundance for this music. Dressed all in black but for his stylish glasses with white frames, he played with immense personality and confidence, seizing the stage from the first and only releasing it when Liberis assumed the melodic lead. The quintet was miked and mixed—I do not know if this is typical for the genre. The sound lost some dimension from the electronics, and the balance was frequently a little off. I could see the guitar or bass frequently engaged in quite complex movements that had no audible counterpart in the mix. Lasting only about 25 minutes, the music entertained and did not overstay its welcome. “Buenos Aires,” not “Buenos Aries.” Since you spell it that way twice, I assume it isn’t a typo.